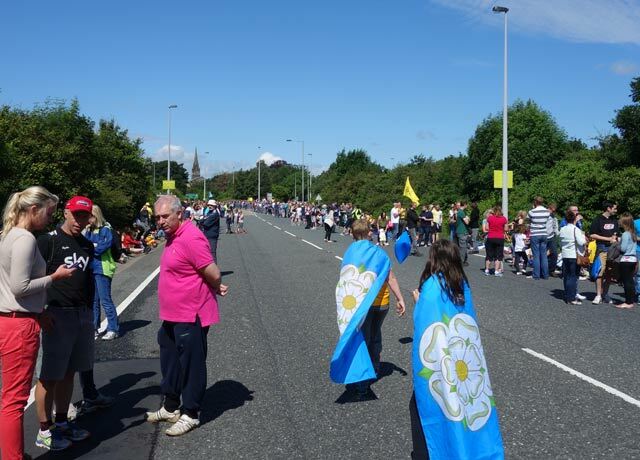 It was a really great day watching the Tour de France in Yorkshire. Despite near saturation media coverage, I still find it difficult to get my head around the notion that cycling in the UK is mainstream. But, today it was all about cycling. 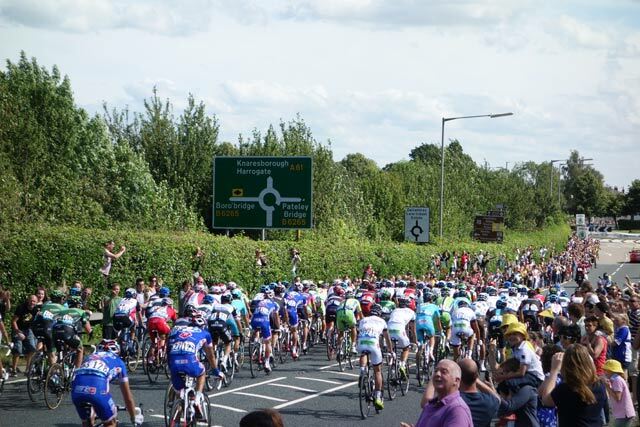 It was surreal cycling along roads I used to train on with virtually no cars, just hundreds of other cyclists. Even when I did see a car, they were kind, courteous and patient. I know it won’t always be like this, but it was something to experience for a day. 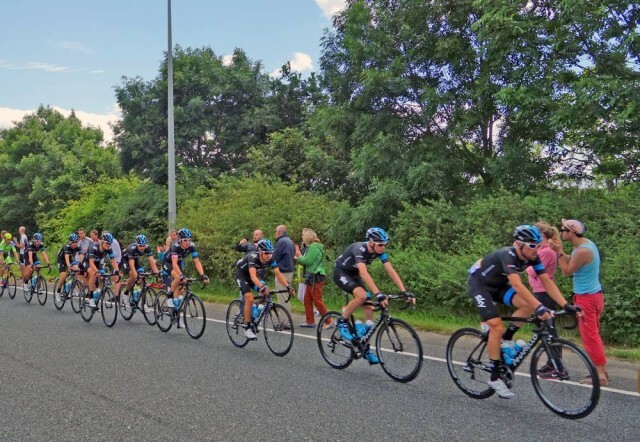 Even at the best of times, it seems cycling in Britain is something to be tolerated – ‘OK, you’re a cyclist but can you please keep in that segregated cycle lane, thank-you very much‘. King of the yellow jumpers. The Black Knight – He is famous for crippling the French army at the battle of Crécy in the 14th century! 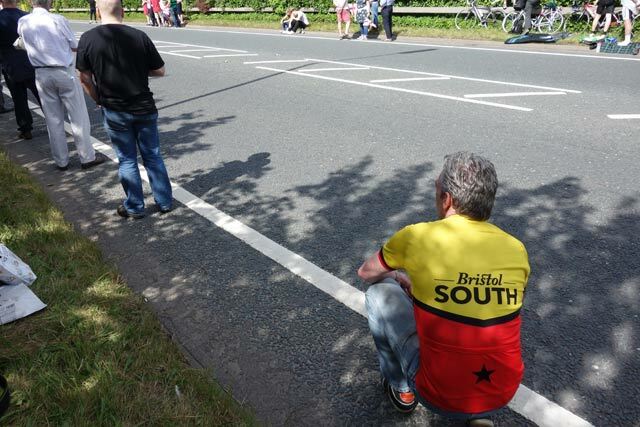 I’d never thought I’d see the day, when my county of birth (1) would come to a virtual standstill to give 100% attention on a cycle race passing through. Such enthusiasm and excitement I haven’t seen since the 2012 Olympics (and that was pretty special). 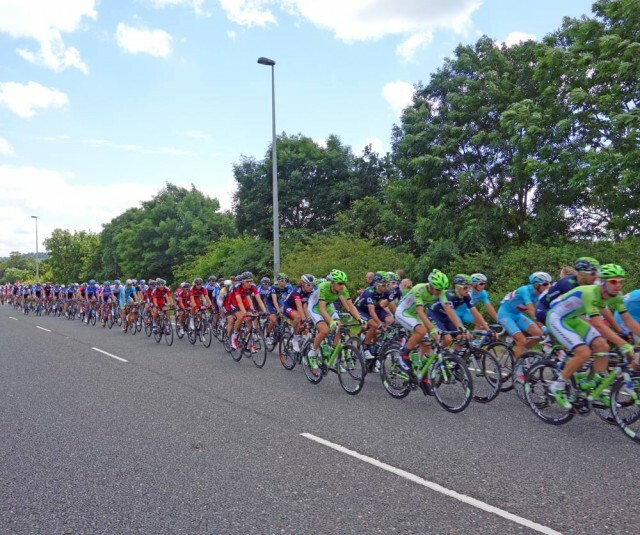 I went to see the Olympic road race in the centre of London, but to be honest, the Tour de France is on a completely different level. 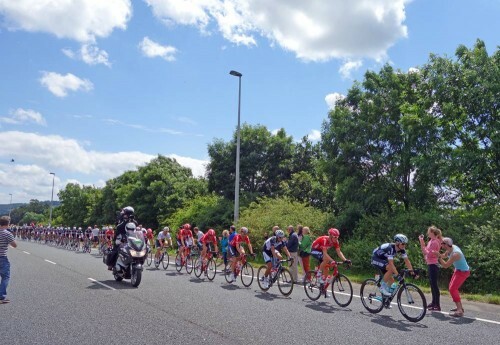 The Olympic road race was just one of many unbelievable events – The Tour de France demands and fully receives centre stage. They don’t fly 60 French gendarmes in, just to taste the local Wensleydale Cheese. It is all a bit surreal, almost unbelievable. 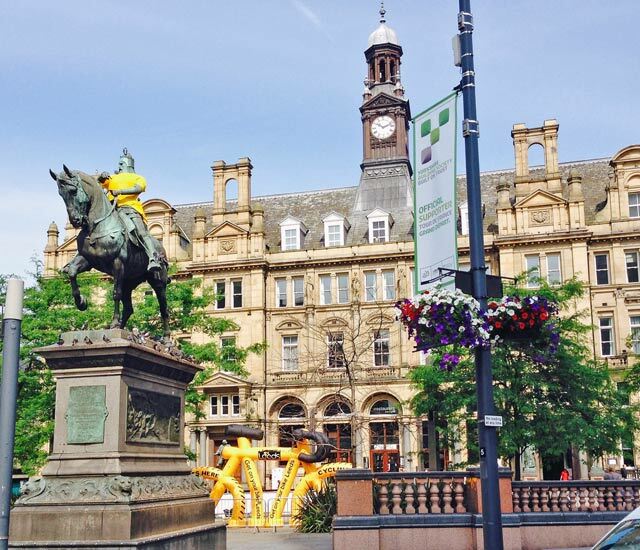 I think many in Yorkshire are proud that we’ve helped add something quite significant to the Tour de France. I thought I’d take the train into Ilkley four hours before the race was due to pass by. I couldn’t get the train because it was full. This is a 600 capacity train running four times an hour. I’ve never seen a full train at Menston before. I walked home and got on my bicycle. I went to watch in two places. First up was Burley bypass. A few miles from my parents house in Menston. 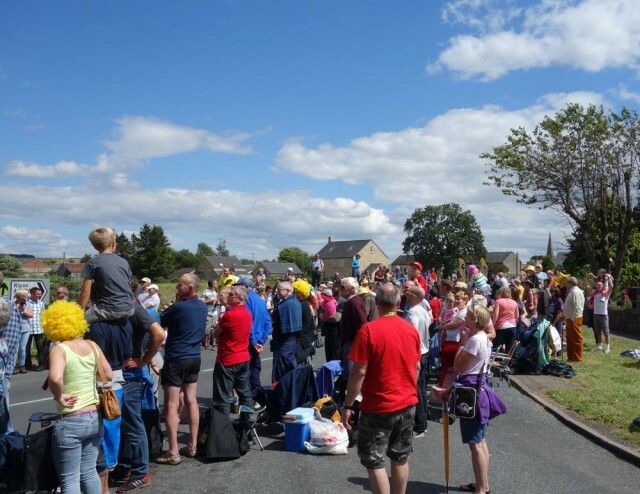 Normally 10km from the start on a flat stage, and spectators are pretty thin on the ground – even at the Tour de France. But, this was the day for everyone to be there. I met some old friends from Otley CC. My whole family had turned out to support the race. I didn’t stand in the busiest spot. But, moved down the road. Still, it was solid with spectators. The roundabout further up the road sounded as if there was a big party going on. 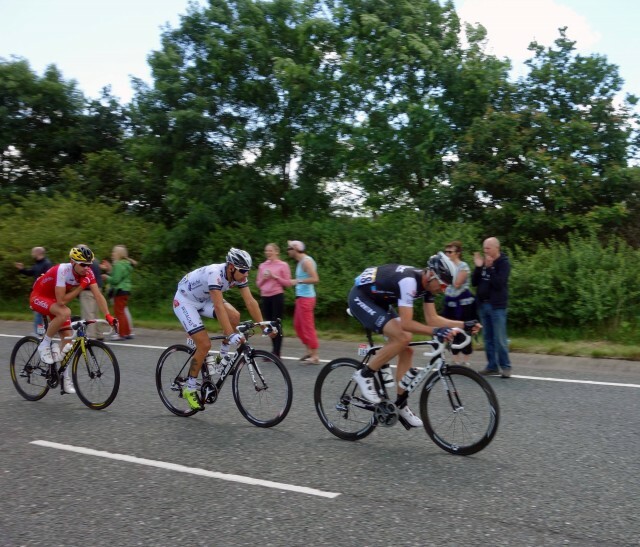 First up, there was only a small break – led by the mighty Jens Voigt giving all 40 + year old riders hope! 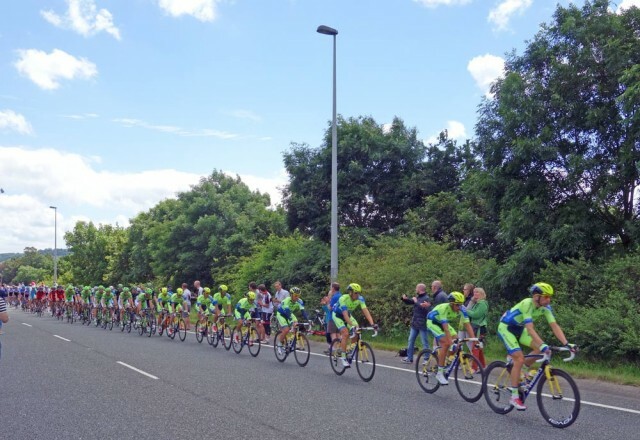 Saxo Tinkoff stood out in new kit. 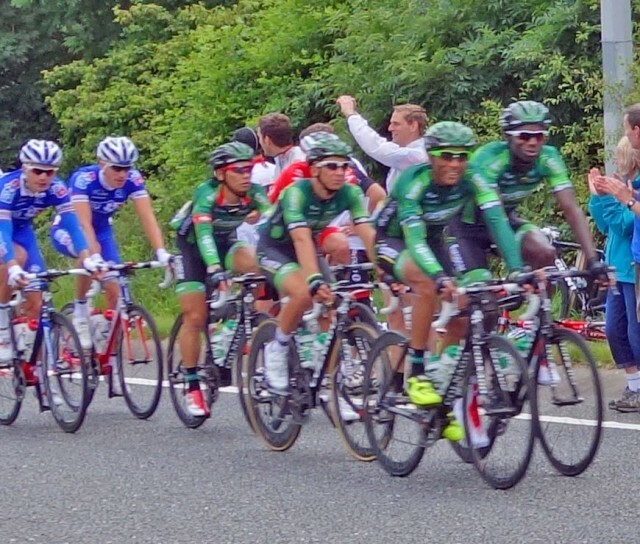 These Europcar riders were enjoying a good chat. It wasn’t time to get down to serious business just yet. After the first passing. It was time to go for a cycle ride. 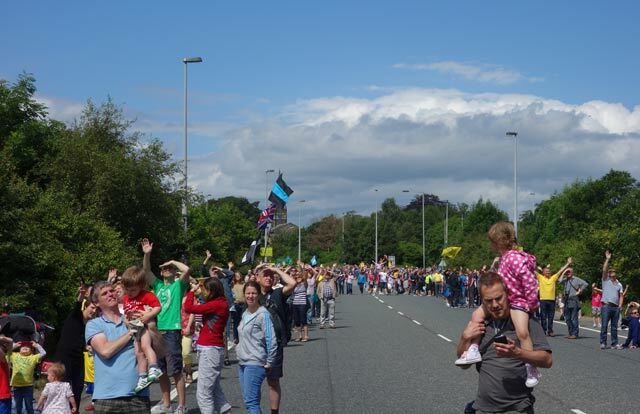 First I had to wade through the huge crowds in Otley. Otley is where I first learnt to ply my trade with the Otley CC. 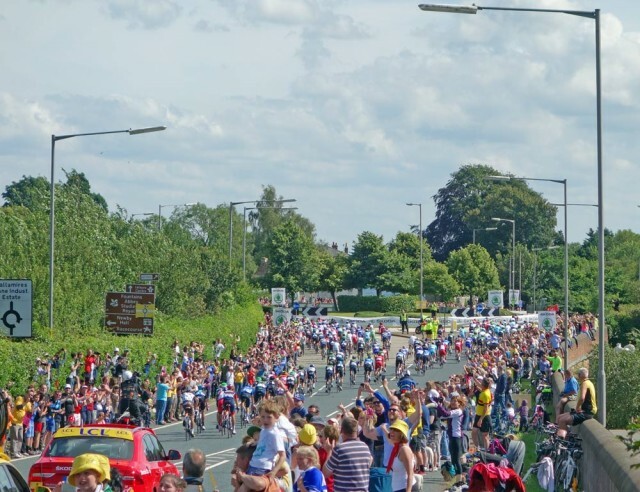 Today, the town took a day off to celebrate the tour and cycling – Otley do know how to have a good party. The town was thick with people. There was a liberating feeling in walking over closed roads. The automobile had definitely been put in it’s place for a day. 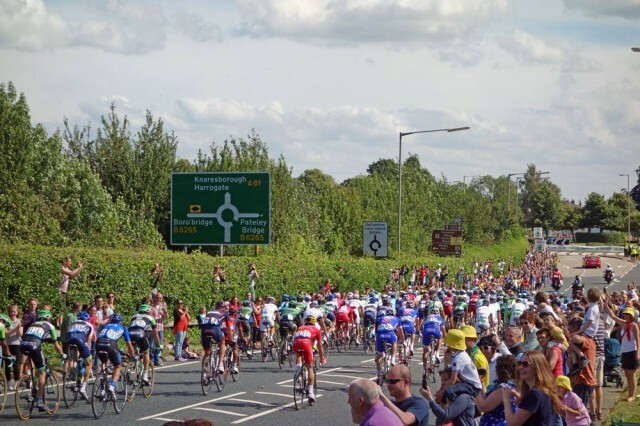 I saw two riders proudly wearing a Menston Velo top – I wish I’d taken a photo. 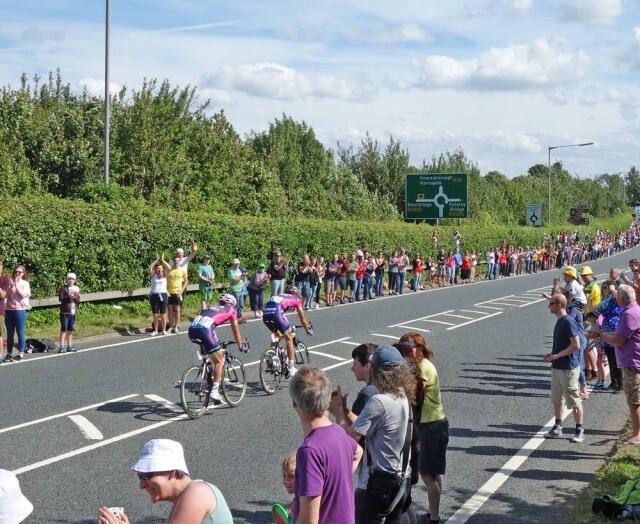 Menston is my village – they didn’t have a cycle club when I was growing up though, but they say cycling is booming now. 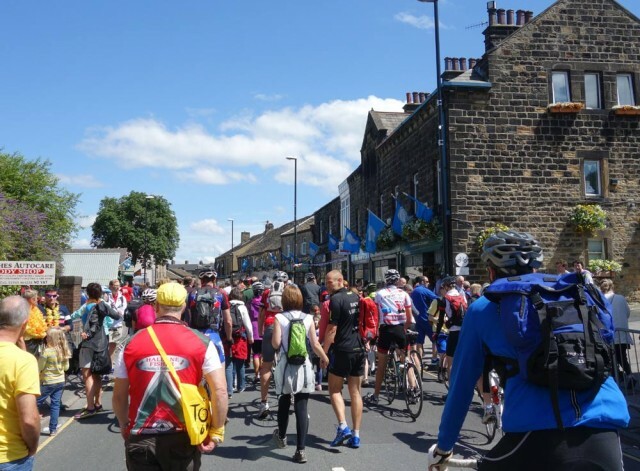 I then rode up to Pateley Bridge over Norwood Edge (with hundreds of others, I thought I was on a world record cyclo sportive at one stage) through Pateley Bridge (which was a ghost town). Then over Trapping Lane from Lofthouse to Masham. One of the great things of the day was just chatting to the person you were standing next to. I met quite a few nice people, including Simon from the omnipresent Bristol South. I enjoyed chatting to strangers by the road. The Tour seemed to give everyone a lot of positivity and enthusiasm. Thank – God the weather was good. It was perfect weather. Two Lampre riders dropped from the pack. 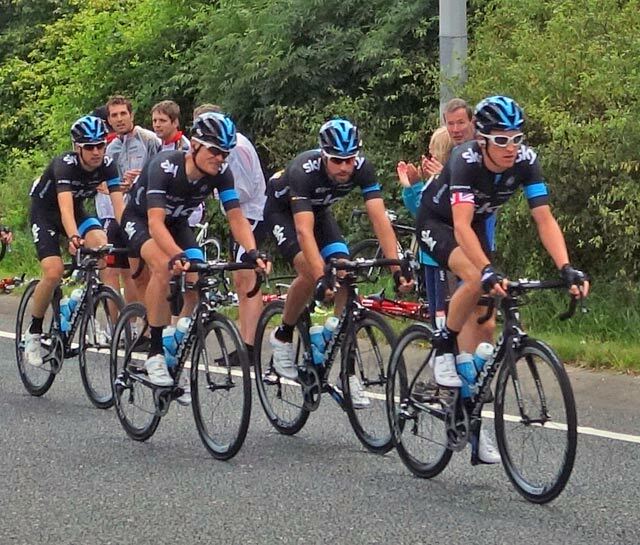 After the race went past, I tried my luck and cycled on to Harrogate on the tour route. 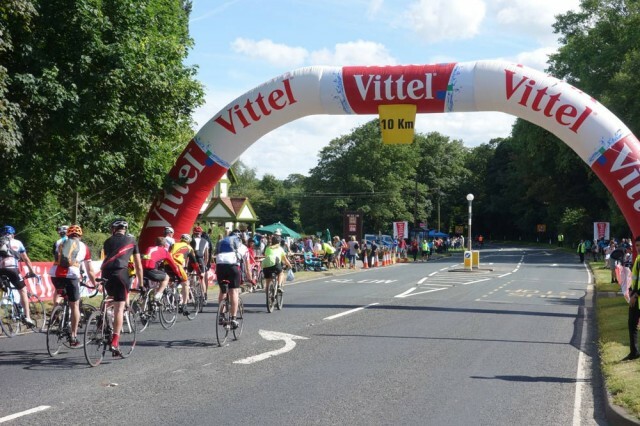 It felt like being part of the world’s biggest unofficial cycle sportive. 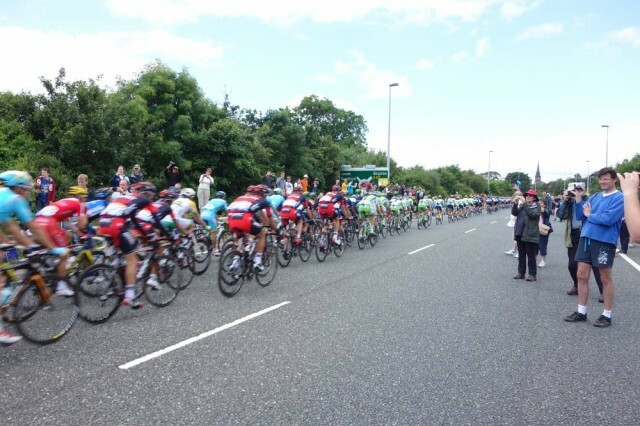 The roads were still semi closed with just hundreds of cyclists taking the opportunity to ride along the tour route. I went through the 10km banner and the 5km banner along with hundreds of others. I missed the finish on TV, but I was having too much fun cycling to worry about watching. If it was a near perfect day, but alas, the gods of sprint finishes intervened and bought the local favourite Mark Cavendish crashing to the ground. It’s hard to say much apart from unfortunately, that’s always a risk of bicycle racing. It will be no comfort to Cavendish that he’s had an unbelievable career and there were 4 million people on the roads cheering him on. Overall, Yorkshire really put on a great show. Particularly impressed with Harrogate council digging up a traffic light the night before the big race. Just shows that where there’s a will there’s a way. Enjoyed reading that Tejvan, summed up really well the experiences of the day (especially Otley as I was there today). Quite envious as well you managed to ride the route today, as my trip yesterday was a bit damp, and you saw it in two places- well planned! Will continue to chase (only conquered two) your KOM’s. 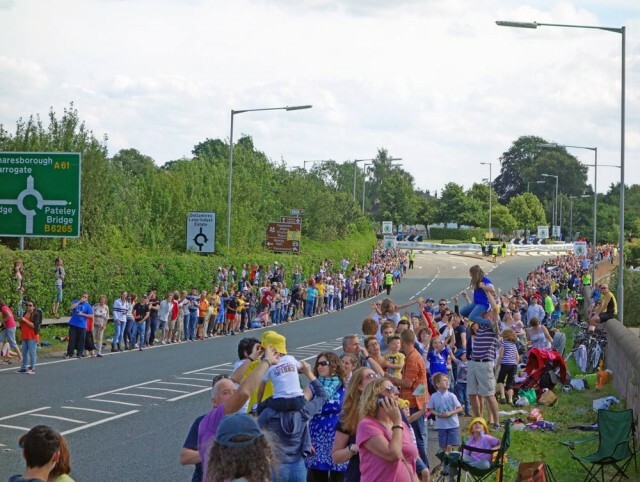 Excellent piece of writing – true cyclist’s impression of a great day for Yorkshire and British cycling. Hope to see you ‘down our way’ sometime soon. Enjoyed the blog report, very good photos. 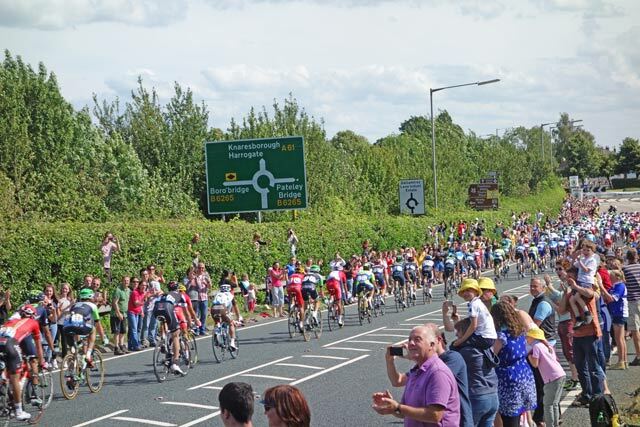 We were also in Otley, a fantastic turnout, we went with two friends who live in Bingley and were not big followers of cycling, but they thoroughly enjoyed the day as well as going with us to watch the second stage on the A59 as they closed in on Blubberhouses. Now in France and off to watch the finish of stage 15 in Nimes (cycling from my location – 50km) and the start of stage 16 from Carcassonne (by car), with Froome out the door is open I guess.